Deal Registration (DR) enables SonicWALL Gold and Silver partners to register new deals or sales opportunities and in return receiving an additional discount for purchasing the products of the deal at an authorized SonicWALL Distributor. 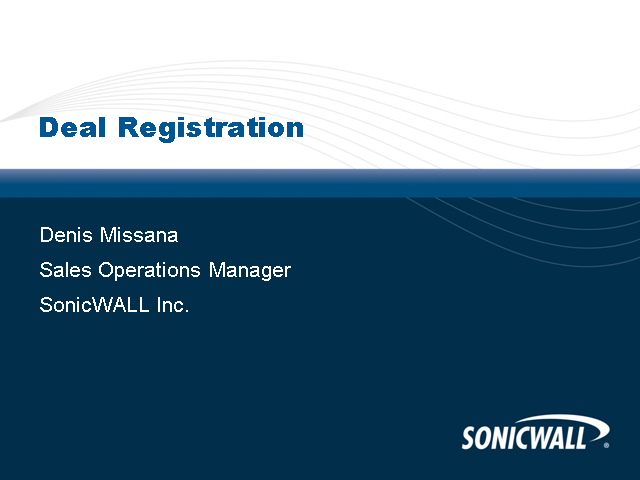 Find out how SonicWALL Deal registration programme works. Overview of the key tools that SonicWALL is offering to their partners in order to support them along the entire sales and marketing activities. Overview of the SonicWALL WXA WAN acceleration appliance. SonicWALL will be launching the new SonicWALLÃÂÃÂ® Enforced Client Anti-Virus and Anti-Spyware - Kaspersky. The solution is easily deployed, automatically enforced and updated network-wide by SonicWALL firewalls on WindowsÃÂÃÂ® desktops and laptops, providing maximum protection with minimal overhead. Sign up for this introductory webinar, and be the first to know everything about this new solution. The all new SonicWALL CDP Version 6, completely re-architected from the ground up, delivers a sophisticated, intelligent and systematic data protection solution with granular policy controls, complete manageability, and rich backup and disaster recovery capabilities. CDP is designed to fit a wide range of deployment scenarios and will integrate seamlessly into your managed service offerings. Join product manager Ken Dang as he shares key product details, partner’s success stories and demonstrates new features and capabilities. This session will review key target markets, use cases, deployment scenarios and how you can simply integrate CDP to your managed service portfolio. SonicWALL's new CDP platform sets a new standard in data backup and disaster recovery; don't miss this exciting and important session. In this webinar, we will discuss the need for WAN acceleration and how SonicWALL's WXA series along with our Next Generation Firewalls can help you identify and resolve inefficiencies in WAN bandwidth usage. We will also show how to setup TCP acceleration and Windows File Shares (WFS). Are you providing frontline technical support to your customers? Sometimes this can be a challenge. Priority Technical Support for SonicWALL Gold partners can help. During this 30-minute presentation we'll show you how Priority Technical Support provides a comprehensive portfolio of benefits, tools and resources designed to help you resolve customer support issues, increase profitability and create competitive advantage. What are the top tips for a high renewal rate? How do you increase the value? What can we do to make renewing easier? All your questions will be answered! The SonicWALL EMEA Partners channel delivers training and informational web casts for SonicWALL Partners about our products, services, partner program and sales tools. The material presented on these web casts is intended for SonicWALL partners in the EMEA region.